Craig Levein remains delighted with the progress made by his Scotland side despite their 1-0 defeat by the Republic of Ireland in Dublin. "Obviously there is a tinge of disappointment in the fact that we did not win," the coach said after the Irish lifted the Carling Nations Cup. "Okay, it is a friendly cup, but the lads put in so much effort I think they deserved something from the match. "I am really thrilled at the week the lads have given Scotland." Scotland defeated Wales 3-1 on Wednesday and Levein saw parallels with that match, when his side also went in at the break a goal behind. "We controlled the game in long spells and we gave up one chance against us and we were punished for it," he told BBC Scotland. "We can look at the reasons for the goal, but that is not important to me at this time. "What is important for me is the progress the team has made in the last year to 18 months. "We were playing a team that are far higher ranked than we are and we dominated possession of the ball for long spells. "In international football, it is difficult to create chances. Well, we created enough chances to win a couple of games." Levein said he would leave it to others to judge whether he has convinced Scotland's fans that a brighter future beckons after they finished runners-up in the new four-nation tournament. "I look at the ages of the squad and how they are developing and it just makes common sense to me that we are going to get better," he said. "We've got players in our team who, at their best, are extremely creative. "We've got a younger squad than most international teams. "There are a lot of positive signs, but ultimately it is difficult to get round the fact that we have lost." However, Levein stressed that the forthcoming Euro 2012 qualifiers would be the real test for his side. "The crucial time period comes September/October," he said. "If we continue the rate of improvement, we will give ourselves a great chance to qualify." Levein had handed winger James Forrest and defender Grant Hanley their first international starts and believes they have done enough to show they will enhance the size of his squad. "I thought they handled the situation well, particularly Grant Hanley," said the national coach. "He looked like an international player and he is only 19 years of age and that is a huge plus as this will have done him a world of good." 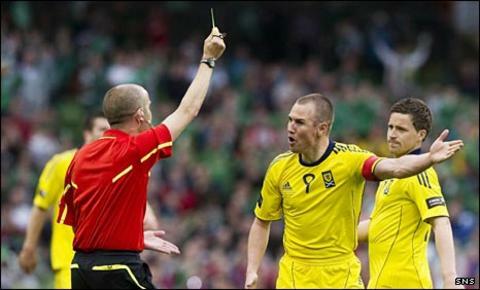 Scotland captain Kenny Miller thought he should have been awarded a penalty in the closing stages after Stephen Hunt grabbed his arm as he looked to shoot. "I thought it was a stonewall penalty," said the Bursaspor striker. "Not only was it a penalty, but the lad has knocked it out for a corner as well." However, like his coach, Miller was satisfied with his side's performance in a match the Scots had to win to prevent the Irish winning the inaugural trophy. "In the second-half particularly, we put them under a lot of pressure, created a couple of great opportunities to get back into the game, but unfortunately we didn't take them," he said. "We've had three fantastic performances, two good wins and I felt that probably on the balance of play did enough to win tonight. "On another night, we might have scored two or three goals and, barring one shot at goal they have had on target, I felt we dominated the game."